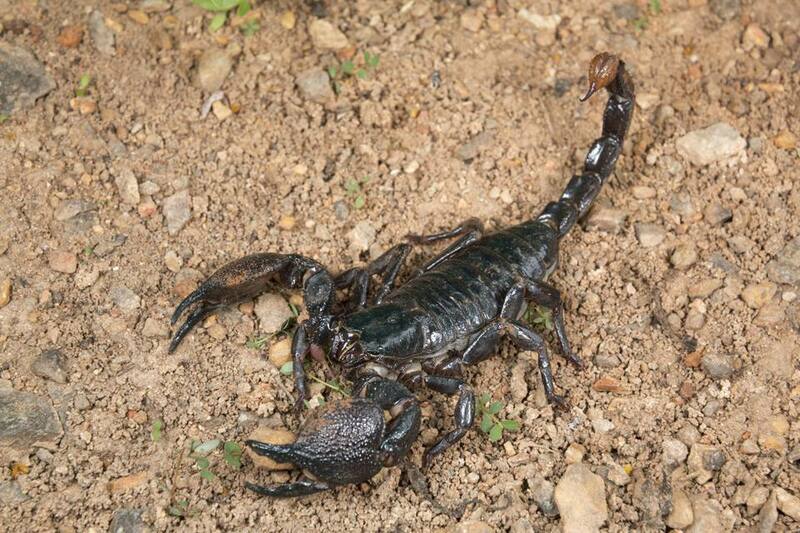 For beginners, the most universally recommended species to keep as a pet is the Emperor Scorpion, Pandinus imperator. It is fairly docile, and its sting is said to be roughly the same as a bee or wasp sting (although serious anaphylactic reactions can occur in some people). For other species, the sting can range from relatively harmless to very painful or even potentially lethal. One of the world’s largest scorpions, they have very powerful, broad pincers and short, strong legs with spine-like setae (hairs). Their body is stout with a thick tail. All of their characteristics are designed to burrow. Pandinus imperator (Emperor): large, fairly docile, and good for beginners. Pandinus cavimanus (Tanzanian Redclaw): Smaller than emperors and can be more aggressive so not as suitable as emperors, but okay for beginners. These are rainforest species that are easy to obtain and care for. These are large scorpions with dark coloration, usually brown or black and sometimes with a greenish tinge. The sting causes localized pain, inflammation and redness for hours to a few days. Unlike many other scorpion species, you can keep them in pairs or a small group. Large rain forest species, but tend to be a little harder to obtain. Fairly benign stings (like wasp); all right for beginners. Both species are easy to keep in groups and worth the cost. This is the largest scorpion in North America at 5.5 inches long. Its imposing size enables it to eat other scorpions and a range of prey such as lizards and snakes. This scorpion is yellow with a dark top and has pincers like a lobster. Its names is derived from the brown hairs all over its body which allow it to sense vibration in the soil. This species is more aggressive than the groups above, and its sting is more painful. They can be kept communally but have been known to cannibalize. Androctonus means "man killer," and it's one of the most dangerous scorpions in the world. They should never be handled under any circumstances. Scorpio maurus - Fairly dangerous, but sometimes young Androctonus australis (highly venomous and potentially lethal) are mistakenly identified and sold as S. maurus. Beginners should avoid both! Sources: Caring for Scorpions (by G. Ramel) and Scorpions ( by K.Pitts).